Fake news, deepening divides of values and beliefs, and growing disillusionment within our government are creating real threats to American democracy. These problems are made worse by a significant lack of comprehensive and objective data about government actions and effectiveness. The US government has over 90,000 jurisdictions and more than five trillion dollars in spending. Although many government agencies report data, they are all displayed on different websites and in varying formats. In the absence of a valid, engaging, comprehensive source on government data, many Americans resort to shortcuts that reinforce their beliefs and deepen the echo chamber effect. USAFacts is the first website that makes dense government data easy to find, visually digestible, and accessible for everyone. 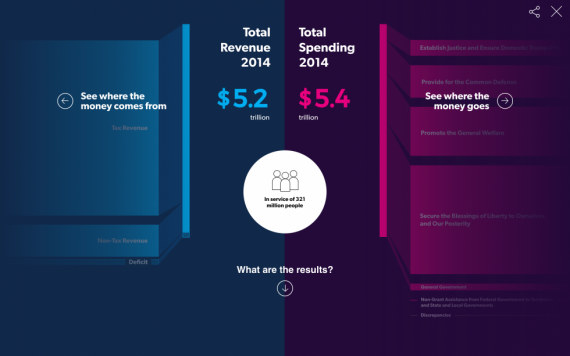 Using beautiful and engaging UX design, the website brings to life over 30 years of government data from 70 different agencies and gives users the power to find, compare, and validate this information, all in one place. With USAFacts, we wanted to make government data not just easier to find, but easier for everyone to understand. To accomplish this, our designers created a cohesive set of data visualizations that makes complex data clearer and more comprehensible. These visualizations scale across the website, bringing disparate data sets under the same unified organization and design. Data visualizations like flow diagrams and sparklines transform dense spreadsheets and convoluted charts into crisp, clean visuals so that numbers can be understood at a glance. These visualizations also offer interactive elements that help users digest the data, such as pop-up annotations and the ability to see changes over time. This means that, unlike other data sites, the contextual design of USAFacts.org allows users to interact with data to comprehend scale and relationships, in addition to facts and figures, and turns sifting through confusing government data into an engaging experience. – In the first 24 hours alone, the site received more than 2.5 million page views, demonstrating the growing demand for an objective source of information. – The design of USAFacts has already been recognized with several industry awards, including Fast Company Innovation by Design and Design Management Institute’s Design Value Awards.